We hope you will enjoy our new Summer seasonal Apple and Cucumber Cider. It is a light crisp medium dry cider made only with the fresh juice of dessert apples and a subtle twist of cucumber. A refreshing thirst quencher made by our small team in Cork. You can find it in the following stockists while stocks last. 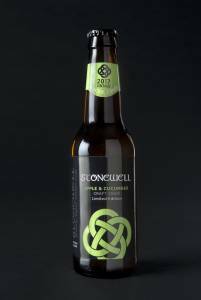 Let us know on social media if you try it on Facebook, Twitter or Instagram where you can find us @Stonewellcider, we would love to hear from you! Pigalle, 111 Barrack St, The Lough, Cork. Bowes, 1 Fleet St, Dublin 2. Bru House, 12 Fairview, Dublin 3, Dublin. The White House, Pearse Street, Kinsale, Cork. The Tap Tavern, 9 Guardwell, Sleveen, Kinsale, Co. Cork. O’Donovan’s Hotel Clonakility, Pearse St, Scartagh, Clonakilty, Co. Cork. The Silver Key, Churchyard Lane, Ballinlough, Cork. Actons Hotel, Kinsale, Co. Cork. Curragower Bar, Clancys Strand, Limerick. Tubridys Bar and Restaurant, Doonbeg, Co. Clare. Celtic Ross Hotel, Rosscarbery, West Cork, Co. Cork. White Rabbit Bar & BBQ, 56 MacCurtain Street, Montenotte, Cork. Mount Oval Bar, Mount Oval Village, Rochestown, Co. Cork. Nelliefreds, Spa Rd, Grove, Dingle, Co. Kerry. The Wine Shop at The Laurels, 186 Whitehall Rd W, Perrystown, Dublin 12. The Ferryman Townhouse, 35 Sir John Rogerson’s Quay, Grand Canal Dock, Dublin. Gallagher’s Gastro Pub, 32 MacCurtain Street, Montenotte, Cork. Ma Murphy’s, 7 New St, Town Lots, Bantry, Co. Cork. The Maple Tree, Slade Castle Court, Saggart, Dublin. Matson’s Wine Store, Bandon, Co. Cork. Matson’s Wine Store, Grange. Co. Cork. The Mercantile, 28 Dame St, Dublin 2. Stillorgan Orchard, 1 The Hill, Stillorgan, Co. Dublin. Watersedge Hotel, Yacht Club Quay, Kilgarvan, Cobh, Co. Cork. The Workshop Gastro Pub, George’s Quay, Dublin. Jim Edwards, Kinsale, Co. Cork. Scally’s Supervalu, Clonakility, Co. Cork. Hayfield Manor Hotel, Perrott Ave, College Rd, The Lough, Cork. The Supper Club, 2 Main St, Sleveen, Kinsale, Co. Cork. The Salt House, Raven Terrace, Galway. Corley’s Abbey Lodge, Claremorris, Co. Mayo. Powerscourt Golf Club, Powerscourt Estate, Enniskerry, Co. Wicklow. Baggot Street Wines, 17 Baggot Street Upper, Dublin 4. The Ballymore Inn, Main St, Kimmeens, Ballymore Eustace, Co. Kildare. Bierhaus, 2 Henry St, Galway. Brickyard Gastropub, Rockfield, Central, Ballaly Luas Stop, Dundrum, Dublin 16. Davitt’s Restaurant, Henry St, Kenmare, Co. Kerry. Scannell’s Bar, 5 Connolly Street, Maulnaskehy, Clonakilty, Co. Cork. O Carroll’s Beach Bar, Ring of Kerry, Brackaharagh, Caherdaniel, Co. Kerry. Kate Kearney’s Cottage, Gap of Dunloe, Killarney, Co. Kerry. The 1601 Off Licence, Kinsale, Co. Cork. D. O’ Sheas Bar, North Square, Inchinaleega East, Sneem, Co. Kerry. Foxy Johns, Main St, Grove, Dingle, Co. Kerry. Old Head Golf Links, Downmacpatrick, Kinsale, Co. Cork. Scott’s Bar, O’Curry St, Dough, Kilrush, Co. Clare. Jones Supervalu, Ennis Rd, Leagard North, Miltown Malbay, Co. Clare. Twomey’s, Castletown, Berehaven, Co. Cork. Cronin’s Pub, Crosshaven, Co. Cork. Milltown House, The-Wood, Dingle, Co. Kerry. The Corner House, Carrigaline, Co. Cork. The Lodge, Myrtleville, Co. Cork. Trump International Hotel & Golf Links, Doughmore Bay, Doonbeg, Co. Clare. Riney’s Bar & Off-Licence, South Square, Sneem, Co. Kerry. Chill Wine Bar & Bistro, Goreybridge, Gorey, Co. Wexford. Collins Supervalu, Carrigaline, Co. Cork. Coughlan’s Bar, 7 Douglas St, Ballintemple, Cork. The Dining Room, Bridge Street, Castlebar, Co. Mayo. Dock No. 1 Seafood Bar and Restaurant, 1 Dock Rd, The Docks, Galway. East Side Tavern, 104 Leeson Street Lower, Dublin 2. Gibney’s of Malahide, 6 New St, Malahide, Co. Dublin. The Goose Off Licence, Dublin. Guilders Bar, Carrigtwohill, Co. Cork. Horseshoe Restaurant, Listowel, Co. Kerry. Ice House Hotel, The Quay, Quignalecka, Ballina, Co. Mayo. Jacobs on the Mall, Cork City. JJ O’Driscoll Superstore, Ballinlough Rd, Ballintemple, Cork. Joyce’s Supermarket, Tuam Shopping Centre, Abbey Trinity Road, Tuam, Co. Galway. Joyce’s Supermarket, Father Griffin Rd, Galway. Kennedys Bar, Upper Main Street, Dingle, Co. Kerry. Killarney Heights Hotel, Cork Road, Killarney, Co. Kerry. Lilac Wines, 117 Philipsburgh Avenue, Fionnradharc, Dublin 3. O’ Mahonys Of Watergrasshill, Main St, Meenane, Cork. Malahide Golf Club, The Grange, Beechwood Lane, Beechwood, Malahide, Co. Dublin. Maxwell’s Bistro, 14 Williamsgate St, Galway. Morgue Pub, Templeogue Rd, Templeogue, Dublin 16. Number 21 Off Licence, Lismore Park, Waterford. Number 21 Off Licence, Midleton, Co. Cork. Number 21 Off Licence, Charleville, Co. Cork. Number 21 Off Licence, The Glen, Cork City. Number 21 Off Licence, Listowel, Co. Kerry. O’ Connells Bar, 8 Eyre Square, Galway. Old Arch Restaurant, James St, Clare, Claremorris, Co. Mayo. The Old Punch Bowl, 116 Rock Rd, Merrion, Blackrock, Co. Dublin. Paddy Blues Off Licence, Gorey, Co. Wexford. Padraicins Seafood Bar & Restaurant, Furbo Beach, Galway. Ferrit & Lee Restaurant, Distillery Walk, Midleton, Co. Cork. Redmonds Off Licence, 25 Ranelagh, Dublin. The Riverside Hotel, The Promenade, Killagoley, Enniscorthy, Co. Wexford. Roches Bar, Duncannon The Hook Peninsula, New Ross, Co. Wexford. Shoot the Crows, 1-, 3 Castle St, Sligo. The Talbot Hotel, The Quay, Whitewell, Wexford. Thunder Road Café, 52-57 Fleet St, Temple Bar, Dublin. Tigh Neachtains, 17 Cross Street, Galway. The Towers Bar & Restaurant, The Quay, Cloonmonad, Westport Harbour, Co. Mayo. Waterville Golf Links, Murreagh, Waterville, Co. Kerry. The Wine Centre, 5 John Street Lower, Gardens, Kilkenny City, Co. Kilkenny.